In a little over a week, Christie's in London will be holding an Important Jewels sale -- with tiaras included! Here's a look at the four tiaras that will be auctioned on June 13. 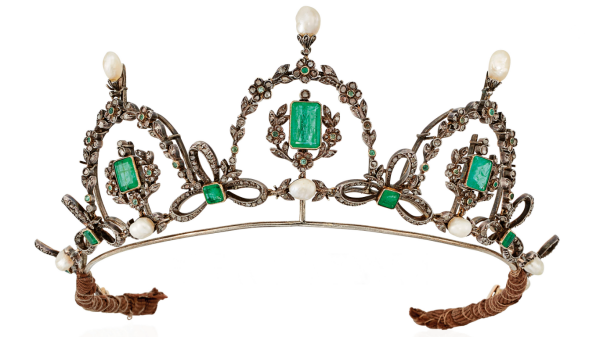 Lot 62 in the auction, property of "a lady," is a convertible piece that can be worn either as a necklace or a tiara. The lot notes describe it as follows: "Square and rectangular-cut emeralds, rose-cut diamonds, silver and gold, with tiara frame, circa 1890." The notes also explain that the pearls set in the piece have not been tested for natural origin. The jewel is expected to fetch between 6,000 and 8,000 pounds. 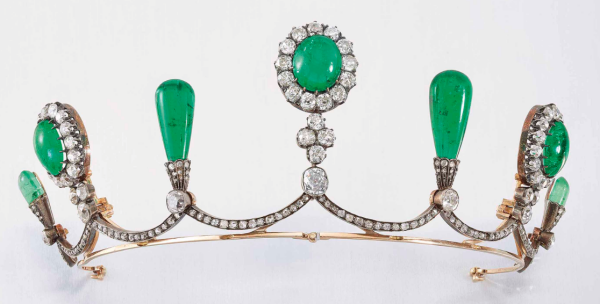 Another diamond and emerald tiara is featured in Lot 106. This tiara is described as having "drop-shaped and oval cabochon emeralds, old and rose-cut diamonds, silver and gold, circa 1880." The central three elements are Colombian. Its estimate is much, much higher than the other emerald example on offer: it's expected to fetch between 70,000 and 90,000 pounds. But that may be partly because of the (vague) provenance offered: the tiara is being sold by "a royal family." Which royal family? It's not clear. I don't personally recognize this piece, but I welcome comments from anyone who does! 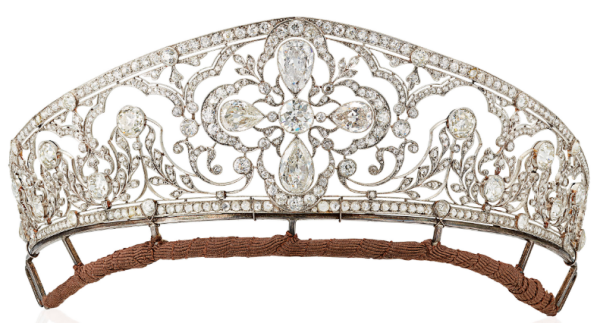 By contrast, the "Important Belle Epoque Diamond Tiara" offered in Lot 179 has documented royal roots. The tiara once belonged to members of the Bourbon-Two Sicilies family; its last royal owner was Maria da Gloria of Orleans-Braganza (the former wife of Crown Prince Alexander of Yugoslavia), who sold the tiara at auction in 1982. The notes for this auction describe it as being set with "old-cut, old pear-shaped and rose-cut diamonds, platinum, circa 1905." 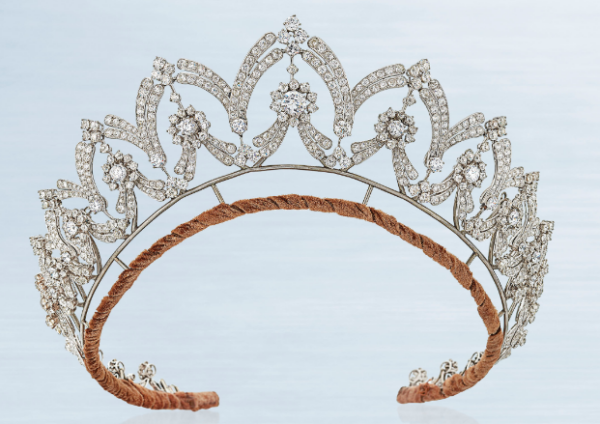 The tiara's auction estimate is set at between 140,000 and 210,000 pounds. The fourth and final tiara in the auction, Lot 188, is another convertible piece, this time by Boucheron. 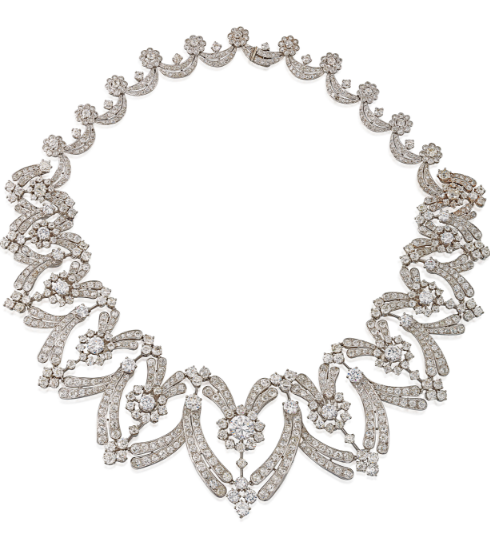 The Art Deco tiara/necklace is set with "circular and old-cut diamonds, with tiara frame, circa 1935," and it's both signed and presented in its original Boucheron case. The jewel is estimated to fetch between 35,000 and 45,000 pounds. Here's a view of the piece in its necklace form. The lot notes on this piece are a bit confusing and may need some correction. Christie's notes that the jewel, now being sold by "a gentleman," was formerly "the property of Mrs Anne Norman, wife of the Right Honorable Sir Henry Norman and daughter of Henry Duncan McLaren, 2nd Baron Aberconway." The 2nd Baron Aberconway did have a daughter named Anne -- Dame Anne McLaren (1927-2007), a pioneering developmental biologist whose work helped establish techniques used in the process of in vitro fertilization. Anne's husband, though, was Donald Michie, a fellow scientist and researcher. It was Florence McLaren (1883-1964), a noted political activist and daughter of the 1st Baron Aberconway, who married Sir Henry Norman. (Here's more on Florence from the National Portrait Gallery.) Henry and Florence (not Anne) lived at the Château de la Garoupe, the French home built by Florence's father. It seems much more likely to me that it was Florence, not Anne, who was the owner of this necklace.